OH, THINK NOT MY SPIRITS! 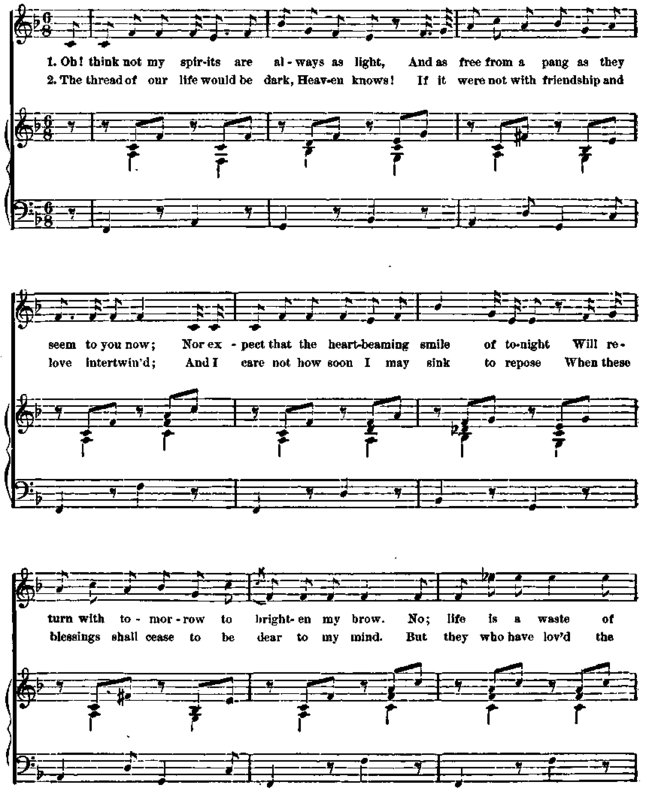 This is another of Thomas Moore's songs, written for the " Irish Melodies." The name of the melody is "John O'Reilly the active." Nothing like a collection of''convivial" songs suggests the real dreariness of all attempts to be light-hearted over the sparkling cup or the crimson bowl. This song of Moore's brings to mind the description of one who saw him just before his intellect began to fail. As Moore was leaving a hatter's store, he turned eyes in which the tears were brimming to the western sky as he said: " They are all gone,�every friend I had in the world; I am like a stranger now in a strange land."